Invite eye-catching, modern style to your bedroom with the Urban Habitat Cora 7-piece Cotton Comforter Set. A white oversized medallion, with intricate, hand-drawn geometric details, is beautifully showcased on a black cotton base. 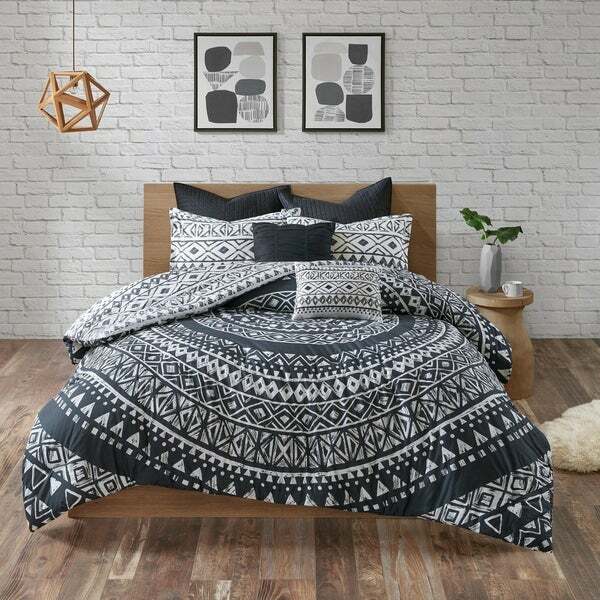 The printed reverse flips the color palette with black geometric motifs showcased on a white base, creating a customized look to your bed. Two printed shams mirror the design seen on the reverse, while two quilted euro shams add texture and charm to the bedding set. To complete the comforter set are two decorative pillows: one square pillow with fabric manipulation and an embroidered oblong pillow that flaunts a coordinating design to match back to the top of bed. Machine washable for easy care, this cotton comforter set will transform your bedroom into an urban retreat. This comforter set is super stylish and comfy. We love that it comes with so many pillows. The large pillows do require 29x29 pillows and it looks great once set up. this comforter is comfortable and a fun print. It barely hangs an inch over the sides of my king bed. The picture shows more coverage. Would recommend buying a king for a queen bed. This set is beautiful! The color is perfect, the design is lovely, and the quality is very good. It brightens my room without overwhelming it. I definitely recommend this. I love the pattern it's just as pictured and works well for giving your room that boho vibe. The comforter is soft and cozy. I paired it with the bare bottom sheets in black and I'm in love! Love this comforter.. Really complements the black and white bedroom!! The blanket was s just a gorgeous pattern! All the extra pillows are a plus wish there was a bed skirt of course, overall satisfied with the great purchase! I like the comforter it look like what the picture shows on the website. I wish it came with A bedskirt but I think I’ll make one. The width and length were shorter than I prefer. I liked the pattern and color.